The Saturday Program, Cooper's oldest outreach program, provides free art classes to New York City high school students. Photo by Mario Morgado. When Samer Houzayn, an engineer from Sixth of October City near Cairo arrived in New York, he started Googling terms such as “immigrant,” “education” and “helping immigrants.” He hit on The Cooper Union’s Retraining Program for Immigrant Engineers, but had his doubts when he learned that all classes were free. “I said, ‘I don’t believe it could be true!’ But a friend of mine who had gone through the program said, ‘Yes, it’s real!’” After only four months in the United States, he found himself in a certificate program that allowed him to convert his skills as a petroleum engineer into becoming an MEP engineer—one who designs and maintains mechanical, electrical and plumbing systems—a skill set that is in far greater demand in New York. According to Siri Comeau McDonald, Cooper’s new director of corporate and foundation relations, Houzayn is one of thousands of people who have benefitted from the many “outreach” educational efforts run at The Cooper Union that provide free or low-cost classes for working people and youth beyond its matriculated students. “Each year these outreach programs provide classes to a population nearly as large as Cooper’s full-time student body. This aspect of Cooper’s service to the people of New York City may be less well known, but its impact on the lives of those with great need is no less meaningful,” she says. Comeau McDonald gathered data on these programs and discovered impressive results. As a kind of parallel union, outreach classes at Cooper offer a broad scope of subjects to students of varied ages and origins, and this past year, served more than 1,000 people. The programs demonstrate that, in an era of dwindling opportunities for the poorest and most vulnerable New Yorkers, Cooper is still helping people acquire skills for meaningful work. “The Cooper Union is an oasis,” says Marina Gutierrez, director of the Saturday Program, the oldest of Cooper’s outreach efforts. 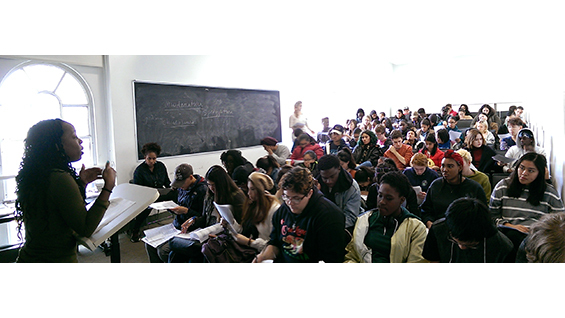 “It’s the direct descendant of Peter Cooper’s imagining a world where it’s possible for all citizens to become literate and articulate in culture and politics.” The Saturday Program was founded by students of the School of Art in 1968 during a larger, national movement to make access to higher education more equitable by organizing alternative schools where college undergraduates would teach students coming from poorly performing school districts. This was exactly the spirit in which many of the outreach programs at Cooper began: a commitment to putting quality education within reach of all. 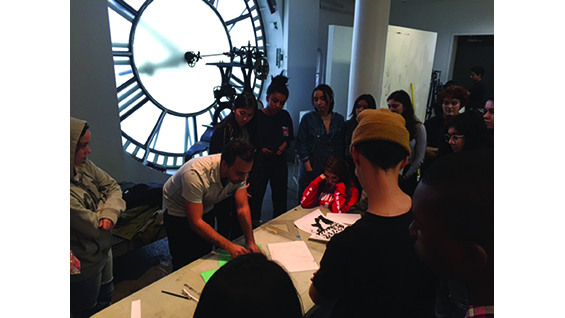 The art programs include classes in drawing, painting, sculpture, animation, 2-D design, 3-D design, photography, graphic design, portfolio preparation and printmaking— the only free printmaking course available to New York high school students. Cooper’s multiple STEM (science, technology, engineering and mathematics) outreach programs are similarly designed to meet the needs of underprepared students while introducing them to science-related fields. In 2016 alone, the STEM programs served 362 students. Most run at no cost to them. The programs include Summer STEM, a six-week program for high school sophomores and juniors in which students work in teams to solve an engineering problem while learning presentation and writing skills; STEM Saturdays, a 10-week, tuition-free program held twice during the school year that teaches high school students basic engineering concepts; STEM Days, one-day science workshops provided free of charge for fourth through twelfth graders; and High School Inventors, in which students from two neighborhood high schools are immersed in a rigorous, hands-on engineering project. After designing and building a Rube Goldberg machine, they compete against high schools from all over the region. Cooper Union students, who act as mentors for the younger students, teach many of these courses. 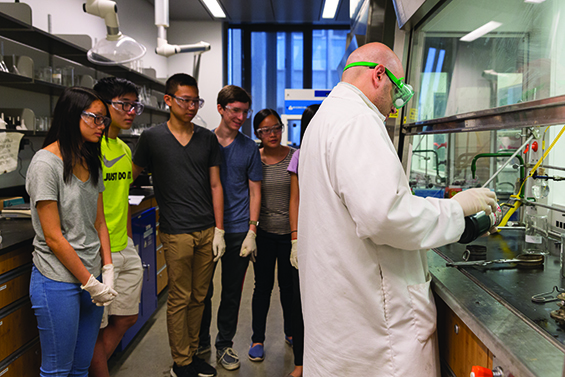 George Delagrammatikas, associate professor of mechanical engineering and the director of all of Cooper’s STEM outreach programs, designs them with an eye to bringing in students who are not traditionally represented in STEM careers. Last year’s Summer STEM session consisted of 86 girls, 42 percent of the 212 attendees. Almost half the group was made up of Asian students; 11 percent were Latino, and 10 percent were African American. “If the instructor or teaching assistant is a person of color or a woman, that’s when the students get inspired and gain confidence that they can also achieve those positions,” Delagrammatikas, says. The Retraining Program for Immigrant Engineers has even greater diversity, with women making up a third of its approximately 225 students per year. In spring 2016, participants came from all points across the globe, including 30 percent from the Middle East and North Africa and 26 percent from Europe and Central Asia. Some are refugees; others are victims of human trafficking. The program is co-run with CAMBA, a nonprofit organization in Brooklyn, that provides in-depth workshops for resume writing, preparing for interviews and job readiness. They also pair students with industry-specialized job developers. Since the program teamed with CAMBA, job placement rates in engineering fields have risen. In fact, in spring 2016, 89 percent of the placements were in engineering-related jobs. In its 26-year history, the program—which has no equivalent in the New York area—has served more than 4,700 people. All these costs are underwritten by an assortment of funders, who are consistently impressed with the innovative ways that the Cooper outreach programs fulfill many of the most important educational goals for underserved and underfunded New York City communities: academic preparation; social development exercises that teach students to collaborate; and a fusion of content with activities. Funders such as the Jacques and Natasha Gelman Foundation, the Altman Foundation and the Jeffrey and Paula Gural Foundation (among a host of benefactors) have consistently given to the Saturday Program and Art Outreach. To encourage individual donors to pitch in too, Richard Lincer, former chair of the Board of Trustees, matches any individual gift to the Saturday Program up to $15,000 each year. The Robin Hood Foundation, a group dedicated to funding poverty-fighting initiatives, has given generously to maintain the Retraining Program for Immigrant Engineers. A leadership grant from the Alfred P. Sloan Foundation and support from the Pinkerton Foundation let Cooper launch STEM Saturdays last year to reach more students during the academic year. Besides the funds needed for salaries and daily materials, these grants pay for the microcontroller kits and laptop computers that students use during the 10-week program. Those who successfully complete all the assignments and have perfect attendance are awarded the kits and laptops to keep at the conclusion of the program. Summer STEM’s most generous donors include Con Edison, the Henry Sterne Trust and the Pinkerton Foundation. Their donations allowed more than half of last year’s students to attend free of charge or at a discounted rate. The High School Inventors program is financed by grants from the participating high schools, LaSalle Academy and Grace Church School. The impact is even more immediate for students in the Retraining Program for Immigrant Engineers. While the average starting wage of participants in the past two years was $9 an hour, after attending the program their starting wage was, on average, $21 an hour. For instance, Craig Fagan, who moved to New York from Jamaica, took courses in National Electrical Code and Linux in 2016 and now earns $44 an hour as a roaming engineer for T-Mobile. “The program brings immigrant professionals together, helps them expand their professional network and provides opportunities to take advantage of those connections,” he says. Besides having a direct impact on New York’s economy, the program’s alumni are working at jobs that keep the city running. In fact, one graduate, Ben Abanilla, is now employed as a senior electrical inspector for Parsons Brinckerhoff, where he works on the Second Avenue Subway, a project that abounds with Cooper alumni (see story on page 24).